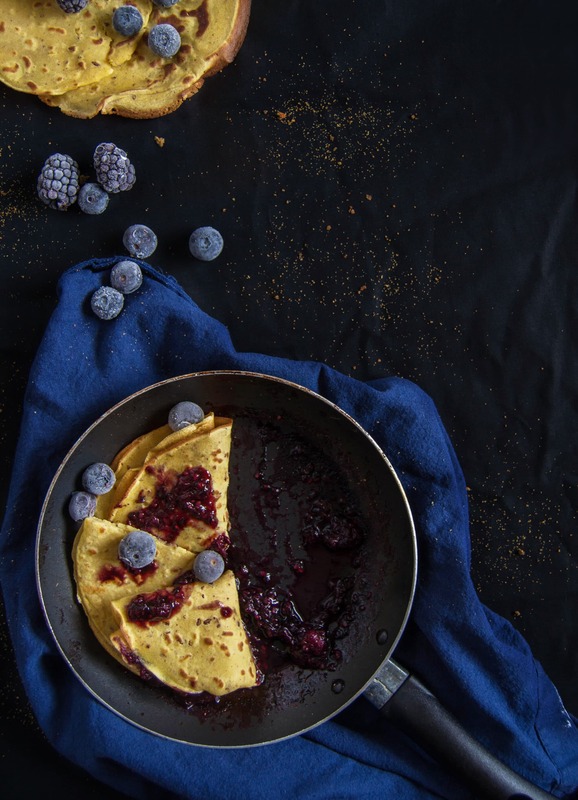 In this post you will find the recipe for these vegan gluten free crepes. I confess,I’m not very close to gluten free cuisine. However when I absolutely want to do something and success, I always do my best, I try and try again, sometime I fail and repeat. Today I’m sharing these gluten free crepes made with chickpea flour and flax seeds, a source of clean carbs and fats. These little babies are so versatile: you can make them savoury, just skipping the agave syrup, for brekky/snack or lunch/dinner. As I always say: let your imagination run free! In case you didn’t know, chickpea flour is an excellent alternative to all purpose ot others, whether you suffer from celiac disease or not. Also it is rich in vitamins, minerals and many other benefits. Oh, talking about chickpeas: I’ve recently experimented a recipe using aquafaba, the cooking liquid of beans and other legumes. The recipe came out delicious and I was so satisfied! I already baked with aquafaba some while ago, but I miserably failed. What did I say in the first paragraph? Try, fail, repeat. And success. To make these simple vegan gluten free crepes, sift your flour in a bowl, then pour gradually the water and whisk gently. Add a pinch of salt, the agave syrup to sweeten, a drizzle of EVOO and the grounded flax seeds, stir and let set in the fridge for at least half an hour. Note: I found some chickpea flour inside my pantry that I previously “cooked” in the oven at 90°C/175°F for three hours. This process simplifies the preparation since it breaks the polypeptides. If you don’t do it, it’ll work as well. When you’re ready to cook, pour a bit of batter on a very hot non-stick pan and rotate to let it spread homogeneously. Cook two minute per side then serve with fresh fruit, maple or agave syrup, jam, or yogurt and honey for a non vegan version.